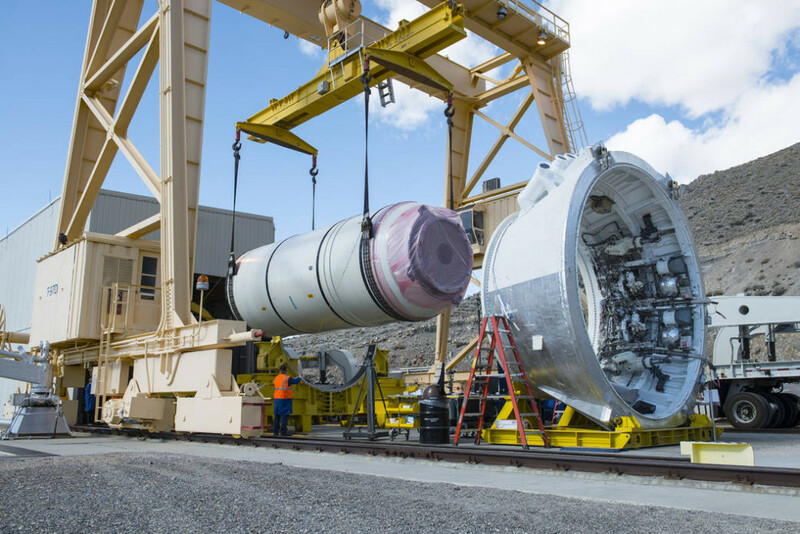 March 9, 2016 – The fifth and final segment for a full-scale test version of NASA’s Space Launch System booster was delivered March 2 to Orbital ATK’s Promontory, Utah, test site. The aft — or rear — segment of the booster will be assembled with the other four segments, currently at the test stand, and outfitted for a second booster qualification ground test this summer. The test will measure the booster’s performance at a cold motor conditioning target of 40 degrees and also demonstrate that it meets applicable ballistic requirements. NASA successfully completed the first booster qualification test in March 2015. The two full-scale tests provide crucial data to support booster qualification for the first two flights of SLS with NASA’s Orion spacecraft. When completed, two five-segment boosters and four RS-25 main engines will power SLS, with Orion atop, on deep-space missions, including to an asteroid and ultimately to Mars. Orbital ATK is prime contractor for the SLS boosters. Lockheed Martin Space Systems of Littleton, Colorado is the prime contractor for the Orion spacecraft.